Slow Cooker Kung Pao Chicken, The Easiest Crowd-Pleaser You'll EVER Make! After taking your first bite of Slow Cooker Kung Pao Chicken, you’ll vow to never order takeout again. The tender chicken, peanuts, chili peppers and flavorful vegetables are simply divine — and that’s not even the best part! I’m always on the hunt for ways to satisfy my Chinese takeout cravings. 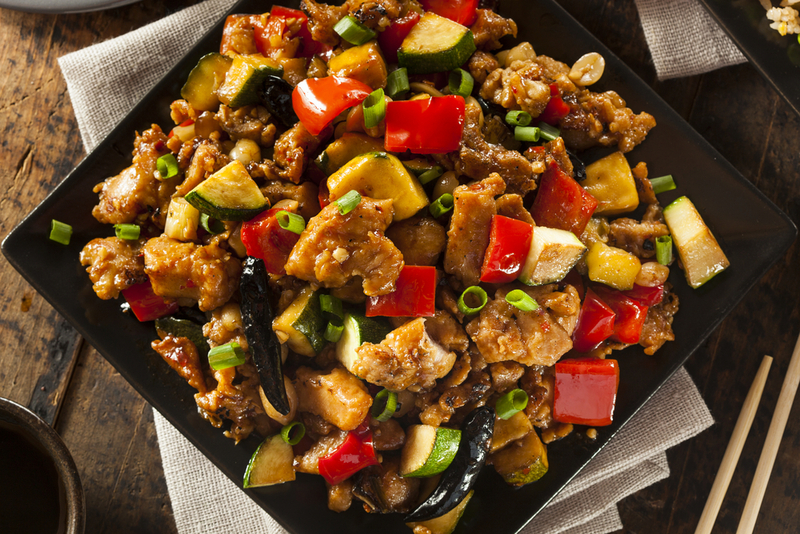 That’s why I was beyond THRILLED to find this Kung Pao Chicken by The Recipe Critic. It’s easy AND delicious, making it every home cook’s dream come true! The pleasant crunch of the tasty peanuts is purely delightful. The juicy chicken is fully loaded with flavor from all that slow cooking. However, my favorite part is the flavor-soaked veggies that provide a refreshing experience with every single bite! So what’s the BEST part about Slow Cooker Kung Pao Chicken? It’s surprisingly WAY healthier than anything you order from takeout! It’s delicious AND nutritious. The textures and flavors are guaranteed to give your taste buds the experience of a lifetime. In a large zip-top bag, toss in chicken, ⅔ cup cornstarch and black pepper. Shake until well-coated. Heat a large skillet over medium-high heat. Cook chicken about 2-3 minutes on each side, until lightly browned. Transfer chicken to slow cooker. In a medium bowl, whisk together the soy sauce, ⅓ cup water, honey, hoisin sauce, garlic, ginger and red pepper chili flakes and pour over chicken. Cover and cook on LOW for 2.5 – 4 hours or HIGH for 1.5 – 3 hours. About 30 minutes before serving, whisk together 2 tablespoons cornstarch and 3 tablespoons water in a small bowl. Stir into the slow cooker. Add the dried red chili peppers, red bell peppers, zucchini, and cashews. Cover and cook on HIGH for another 20-30 minutes or until the vegetables are tender and the sauce has thickened up. (Add more water to thin out the sauce to your preferred consistency).